101 Most Used Hungarian Words And The Best Way To Learn Them - Get Smarter with Articles from the Apartmentrentalsinbudapest.com Blog! By Dezso Papp on February 13, 2014. The problem with the free, top 100 Hungarian words lists available - even if they have the pronunciation? They are not based on scientific ground (i.e. they do not start from a quantifiable database, but from other language books). Why learn the top 100 words from Hungarian subtitles? First, why learn the top 100 words. As words are the building blocks of every language. Starting with the smallest building blocks makes sense. At least if you realize how effective Tim Ferriss' method is. There are several top lists available for most languages. I believe subtitles rule over bibliographic text databases. They are more contemporary and more basic. These translates to better usability in everyday life and helps fasten your learning, and lessen the friction. This is the list I have used as a basis to dub my 101 top Hungarian words list from the open source Wiktionary. This came as a bit of shocker, as most lists are starting with 'a / az' (the) but probably this is a small bias coming from the movie industry. You will hear a lot less 'no, nots' in Hungary. 'Csak' (just) is just another popular babys' word along with 'nem' (no). So, it is only natural to find it in a high position on a word frequency list. 'Balra el' (Literally off to left) as Hungarians sometimes say that it's time to end the play/past time. Words are getting longer and more complicated. This how things pass away. So sad. Getting on a higher, sexier level with the next batch. So many conditions, great expectations, games we play, procrastination. And finally we got the famous and often neglected 'köszönöm' showing up at the party. No, no, no. We're not done yet. Here comes the filler words section that you'll need to use to have those flattening late night discussions get going at a party. Or you just want to pretend you get it (only at your own risk). Every good comes to and end, even a most used Hungarian words list! But hey, there's hope there are things beyond! How to get going with these words? What you can do with this 101 fresh and juicy Hungarian words? What about learning them? I have created a little helper to mute the small procrastinator hushing in the back of your mind. Don't disappoint me and yourself and end your journey into the depth of Hungarian with this article. Failing to do the next step and start to learn these words will be your biggest mistake in the next hour or so. 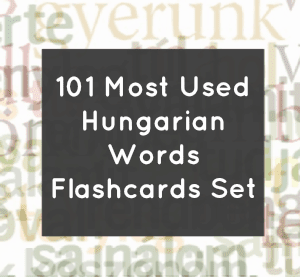 Conquer Hungarian, a mere 20 flashcards a day in a few weeks. fluentin3months' take on why Hungarian is easy! Free language learning resource at 101languages.net. Our custom made free 101 words flashcards package for you to download for free. With audio pronunciations along the Hungarian words.